One of the largest problems that comes about during a home sale is the fact that there are typically seller paid repairs that need to be done. The majority of buyers are going to want both a pest and dry rot inspection and a whole home inspection completed as part of their purchase due diligence. From this inspection, there are typically some repair items that will come about and in most cases the buyer will want many of them taken care by the seller prior to the close of escrow. Negotiating these repairs during escrow can be nerve racking and can also sometimes create delays with closing. My suggestion to all of my sellers is to have their home inspected before we go on the market. This gives us a heads up for any potential issues and also allows the seller to repair major problems. Typically, this creates a much easier sale process. The followiong is and article from "US News" on why having a professional inspection prior to selling is a good thing to do. A home inspection is traditionally known as a part of the due diligence process when a home is under contract with an intended buyer. A professional home inspector will visit the home and conduct a thorough review of the structure, noting any deferred maintenance, defects in the building and the remaining useful life of major appliances and systems such as the air conditioner and water heater. Depending on what the inspector finds, the results can have a powerful impact on the sale of the house. The buyer can ask for repairs or updates to be made, try negotiating on the sale price or walk away from the deal. To avoid the unpleasant surprises a home inspection may bring to light, homeowners looking to put their house on the market can opt for a prelisting home inspection, which provides sellers with a thorough report before the home goes on the market. Sellers have the opportunity to make necessary repairs before potential buyers start touring the property and to avoid a deal that falls through due to structural or maintenance problems that could lead to other potential buyers steering clear of a property that has issues. "The homeowners would do the same diligence as if they were going to buy the house," says Frank Lesh, executive director of the American Society of Home Inspectors. A prelisting inspection costs the same as one conducted while a property is under contract – ranging between $200 and $475, according to HomeAdvisor, depending on location and whether the inspection includes special checks like those for radon or termites. Even in a hot real estate market where buyers are snapping up available homes quickly, a prelisting inspection can help reduce the chances a deal could fall through and get you closer to selling your home for the price you want in the time frame you need. Here are five reasons you should consider a prelisting home inspection before putting your house on the market. Advance notice. Every house comes with its fair share of quirks and problems, and you're probably at least vaguely aware of a few of them – a window that lets water in when it rains or bowing floorboards in one corner of the dining room, for example. If you're planning to put your property on the market, an inspection report ahead of time will help you see all the potential problems together, including some you may not have known about. The prelisting inspection gives you the knowledge to do with it what you will – make repairs or updates or reflect any deferred maintenance in your sale price, explains Drew White, founder and owner of AmPro Inspections in Colorado Springs, Colorado. "[Sellers] have all the cards – they're not going to be blindsided by any major finds from the buyer's inspection," he says. There is a caveat: Once you have the report in your hands, you can't completely ignore a problem. If your inspector finds cracks in the foundation, you'll be required to disclose that information as a known defect to the buyer, or fix it before anyone puts an offer in. "You know the old saying, 'Ignorance is bliss?' Now you can't do that," Lesh says. DIY option. For simple repairs, however, the prelisting inspection gives you the added benefit of being able to take on projects yourself. When negotiating with a buyer, necessary repairs will typically require you to bring in professionals for all work done, even when the fixes are simple. "There's a lot of do-it-yourself projects that the homeowner can do where it's satisfactory, it's not going to be an issue," White says. "If the buyer's inspector finds it – let's say there's an electrical outlet that needs to be replaced or some simple plumbing – they're going to typically mandate that a professional electrician or plumber do it." An outlet replacement or tightening a washer on a faucet – both simple projects homeowners can do – could be a couple hundred dollars for a pro to complete, White says. Contractor of choice. For those bigger projects that do require professionals to come out, time is also on your side when your home isn't yet on the market. "They get time to use the contractors they want," White says. Rather than needing to find a roofer in a specific time frame to appease the buyer, you can shop around for the right price, availability and skill to ensure you're satisfied with the work. Informed pricing. Of course, there are some projects you're just not willing to take on. If you can't afford to fix a foundation issue with your house or you don't want to invest the money to replace cracked tile in a bathroom when you know a buyer will completely renovate it anyway, you don't necessarily have to take care of the repairs. Instead, "that can be reflected in the price," Lesh says. Work with your real estate agent to establish the right sale price, taking into account whatever issues you can't – or aren't willing to – fix before putting the house on the market. Your final sale price will be lower, but it may be better than paying for repairs that won't be fully recouped by a buyer's offer. Buyer may accept results. 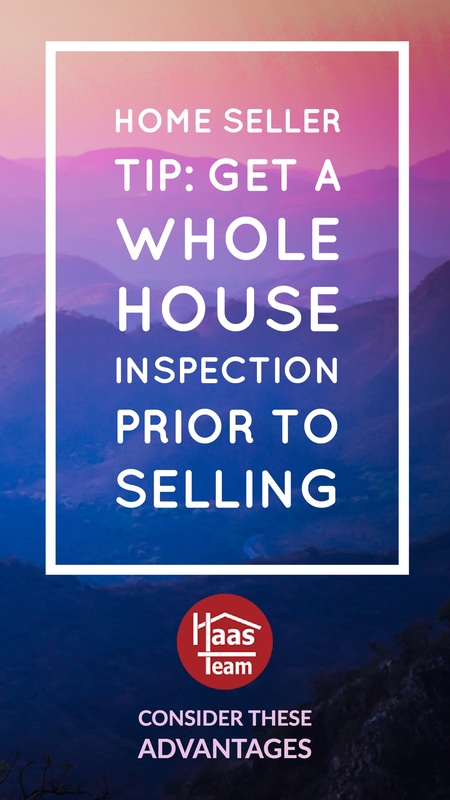 The fact that your house has already had an inspection can have its own appeal for buyers and can serve as a plus if included in marketing descriptions of the house. Especially in a tight seller's market where buyers have to fiercely compete with each other, you may see more buyers willing to accept the prelisting inspection report and forgo an additional inspection during the due diligence period, moving the process along faster. Some home inspectors provide a warranty with their inspection reports. AmPro Inspections is one such company, White says, which helps some buyers feel more comfortable because the warranty can be transferred to the next owner. He says homebuyers accept the prelisting inspection roughly 50 percent of the time. That doesn't mean you can expect buyers to accept the prelisting report as the only inspection. It's like buying a used car from a private individual, Lesh says. While the seller's mechanic may say the car is in great shape, you'll likely want a mechanic you trust to look at it, too. Plus, if any significant amount of time passes between that first inspection and the buyer's offer, more problems could have popped up, especially in winter, Lesh says: "Are the conditions going to be the same in April as they are in January? Probably not."